How an invite-only Facebook forum fended off militant vegetarians and convinced a cultish network of farmers, top chefs, and charcutiers to open-source their knowledge. Behind the James Beard Award and the burgeoning restaurant empire, Linton Hopkins is really just an obsessive pork nerd. The Atlanta-based chef founded the Fellowship of Country Ham Slicers, which celebrates the craft of hand-slicing aged legs of swine, and created a collector’s edition Country Hams of the South placemat (read: treasure map) for the Atlanta Food & Wine Festival. The website for Holeman and Finch, his casual outpost in Atlanta, has a very scientific-looking photo on its homepage that claims ham can cure virtually any malady. Hopkins’ devotion to swine is borderline religious, so it’s fair to ask: Where would a person like him find spiritual kinship with people who worship pork as much as he does? The answer is The Salt Cured Pig—a private, invite-only group that can be found on the Facebook super highway somewhere between Bronies Unite Mid-Atlantic and Nuke the Whales. “You can trust that The Salt Cured Pig is a community of people who actually care about how we procure, practice, and preserve our craft, “ said Hopkins. 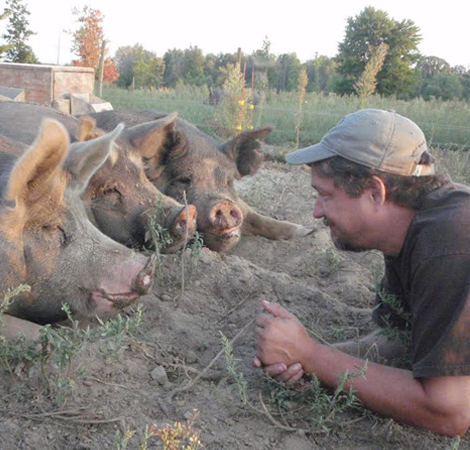 The Salt Cured Pig founder John Patterson has seen the group grow to over 8,000 members. The Salt Cured Pig was founded in 2010 by Michigan native John Patterson, who has since watched his cultish community of swine enthusiasts grow to more than 8,000 members. An average of 100 new people are invited into the group every week by friends already on the inside. This is a place where rockstar butchers and unadulterated porknography take precedence over the media’s breathless rediscovery of edible plant life, and Patterson loves it. And why wouldn’t he? America’s most knowledgeable farmers, meat processors, butchers, charcutiers, chefs, and educators have essentially open-sourced their collective wisdom in his forum. The first leg of The Salt Cured Pig journey is all about Patterson’s original vision of setting out on one’s own into the wide world of DIY curing. Certainly that was my experience when I joined shortly after the group’s inception. For the better part of that first year of membership, my 900-square-foot abode in Washington, D.C. was filled with various meat-curing experiments. Pancetta strung up in the kitchen window and pork jowl hanging from an old planter hook in the corner. Every time I had a question or near meltdown, I went to the group. The most magical animal of them all – Oink oink! Answers would come from people like Josh and Jessica Applestone, the forebears of nouveau butchery at Fleisher’s Pasture-Raised Meats, or Kate Hill, an American expat living in Gascony who runs a pork-centric cooking school, Kitchen at Camont, with a family of French master pig farmers and butchers named the Chapolards. It was like getting private batting lessons from George Brett, the Kansas City Royals Hall of Famer who was my childhood hero. I achieved delicious successes and a few spectacular failures (amazingly, my wife still agreed to marry me that year). More than once or twice, I considered training to become a butcher and opening a shop. A search of the group brings up some culinary star-power, including Craig Deihl, Jonathan Waxman, Nate Anda, Paul Kahan, David Varley, Ryan Farr, Lee Anne Wong, Tom Mylan, and Celina Tio. Peter Kaminsky, whose 2005 book Pig Perfect introduced the world to Chuck Talbott’s pioneering research on heritage pig breeds and flavor, is also a member (as is Talbott). Despite their high-profile status, some still look to The Salt Cured Pig as a place for continuous learning and experimentation. VIPs like Deihl have undoubtedly had an impact in The Salt Cured Pig forum, but the lesser-known professionals represent the group’s real value. These are the workaday evangelists who are carrying forward the movement for responsible pig husbandry and curing. Brunson is known among pork nerds, and he and others like him are the most active in the group’s conversation strings, offering hard-won wisdom to less-seasoned members and doing their best to keep the group focused on safety, tradition, and quality. Others include Cathy Barrow, the writer behind MrsWheelBarrow.com; Adam Danforth, the James Beard Award-winning author and butcher; Carl Blake, who runs Rustik Rooster Farms in Iowa; Brady Lowe, the founder of Cochon 555; Bob Perry, Chef in Residence at the University of Kentucky College of Agriculture; and Bob Del Grosso, a micropaleontologist by training who has taught for decades at the Culinary Institute of America and other institutions. There’s the issue of the pesky vegetarians who have regularly infiltrated the group, calling ironically for Patterson’s slaughter. With all the collective wisdom and shared support, is the forum having a wider impact? Anecdotally, those of us who have been in the group since early on have seen growth in the number of heritage-pig farms, professional curing operations, and restaurants doing in-house charcuterie. According to a three-year study by the Livestock Conservancy, an organization that works on genetic conservation and promotion of heritage-breed animals, the numbers of heritage-breed pigs overall have been growing in recent years. Just a couple days ago, member Stephen Prochaska announced the opening of his new Cedar Rapids, Iowa sausage shop, The Sausage Foundry, and thanked the group for insights and input. That remains to be seen, but we wouldn’t even be having this conversation without the committed core constituency in The Salt Cured Pig. Whether the center can hold is another question, because Patterson’s ride hasn’t all been pillowy white fatback and silky sausage gravy. The group has, at times, been greased by drama. Firstly, there’s the issue of the pesky vegetarians who have infiltrated the group regularly, calling (ironically) for Patterson’s slaughter and, on more than one occasion, getting him thrown off of Facebook (he maintains aliases including Bobby Berkshire, named after the famous breed of curing hogs). One woman was so aggressive that Patterson did a little research and cornered her with Google Maps evidence of a charcoal grill in her backyard. She backed off and the veg hackers have been quiet recently. Patterson’s ride hasn’t all been pillowy white fatback and silky sausage gravy. The group, like so many young phenomena, has at times been greased by drama. Then there was the infamous swine schism. In the early days, when The Salt Cured Pig was small, most of the members were in it to share advanced practices, but things changed as the numbers roared upwards. Some griped that bacon became too dominant a theme (is that possible?) and the comment strings got too heated and meme-heavy. The full administrative team tried to exert some quality control, but the divide had already calcified. A breakaway faction of accomplished home charcutiers, led by bloggers Scott Stegen and Jason Molinari, peeled off and formed Sausage Debauchery, a rival group with a less freewheeling and more pedantic bent. To date, Sausage Debauchery has more than 5,400 members. 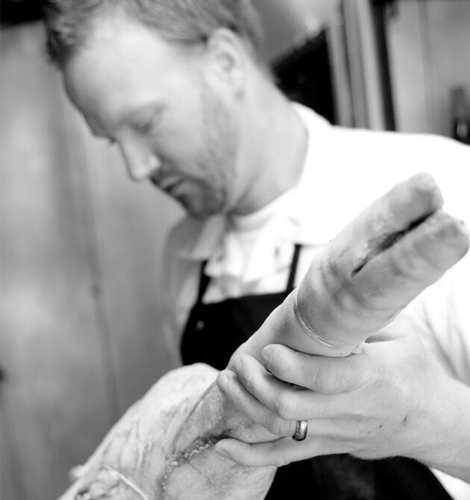 “I think the two communities are alternate sides of the same coin: The Salt Cured Pig is great for people just getting into the curing and overcoming their fear, and Sausage Debauchery is like a watering hole for what I call the ‘meat mafia,’ those of us who live the craft every day,” said Hank Shaw, the James Beard Award-winning blogger and author of Hunt, Gather, Cook: Finding the Forgotten Feast and Duck, Duck, Goose. 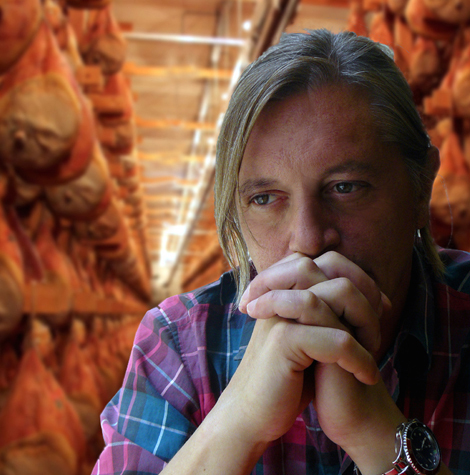 Paolo Sossai, a spiritual guide for pork forums like The Salt Cured Pig, embodied the restless pursuit of quality swine products. Many people hold dual membership and foster friendships in both groups, and the kinship shows through more than any split—as the story of Paolo Sossai makes clear. Sossai, who died from cancer last month, may have been the pioneering digital community organizer for home charcutiers as the head of the Salumi Casalinghi Forum, an Italian listserv where he shared old-world techniques and facilitated discussion on the craft. He was a mentor to many in both The Salt Cured Pig and Sausage Debauchery, dropping in and out of discussions in both groups to offer patient, broken-English–infused explanations of things like the definition of porchetta di testa, and the regional difference between sopressa and sopressata. His death brought forth an outpouring of sympathy. Sossai, like Patterson, Stegen, and many others, was the bond that held the communities together and pushed them forward towards a vision of better, more sustainable farms and food. Which reminds me: I have a big batch of heritage pork shoulder in the freezer that needs my attention.